After a rocky beginning to his American Hockey League career, prospect Darren Archibald is hoping to start anew with a clean slate. 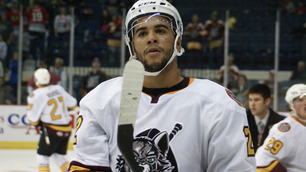 Archibald struggled to find the back of the net with the Chicago Wolves last season, scoring only once in 20 games. But it’s not like the 6-foot-3 forward doesn’t know how to ripple the mesh, he scored 92 times in his 186 game Ontario Hockey League career, including 41 in his final season. He also netted 14 goals to go along with 45 points in 49 games last season with the Kalamazoo Wings in the East Coast Hockey League. It wasn’t always rocky for Archibald in Chicago. The 2011-12 season looked bright right out of the gate as he scored in the Wolves first game of the season, a powerplay goal that gave his squad a 2-1 lead against the San Antonio Rampage. But what many people, including the Newmarket, Ontario, native didn’t realize, that goal at the 11:12 mark of the second period on October 8th would be the offensive highlight of his first season in the AHL. Shift after shift, game after game, shot after shot, for whatever reason Archibald could not score. It was now December 3rd, the power forward had gone 17 games straight without seeing his name on the scoresheet, and at the AHL level when a player doesn’t produce, his ice-time dips and dips and dips, to the point where you don’t play. 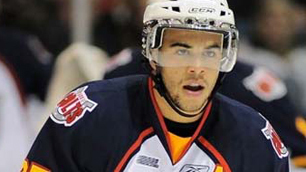 On December 6th Archibald was re-assigned to the Canucks’ ECHL affiliate, the Kalamazoo Wings. “When your playing pro hockey there is always somebody right behind you trying to take your job, and that ended up happening to me,” said Archibald. “Getting sent down was a bit unexpected, but I try to take everything with a positive look. I took it as a learning curve as there was obviously some stuff I needed to work on to develop my game. 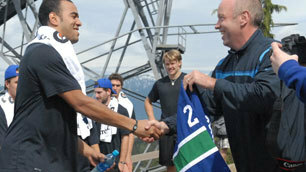 Archibald, an undrafted free agent signed by the Canucks in December of 2010, scored at nearly a point-per-game pace for the Wings; he had 30 points (9-21-30) in his first 36 games with Kalamazoo, which earned him a call back to Chicago on February 26th. But after two more goalless games with the Wolves he found himself right back in the ECHL where he would finish up the season with 14 points (5-10-15) in his final 13 games, including a hat-trick on March 28th against Toledo. Like all hockey players, the off-season is a time to improve as well as take a break from the game that you devote yourself to day in and day out from September to June. There are many things a player can do during the summer months to get a mental break from hockey; some player’s golf, some fish, and some just relax on the beach. Archibald took on a different hobby this past off-season to give his mind a break from the rink: renovating his newly purchased first home. As hockey season approaches, Archibald will trade in his hammer for his hockey stick and look to make an impact in front of some new faces on the Wolves coaching staff. Gone is last season’s head coach Craig MacTavish, who is replaced by former Manitoba Moose and Columbus Blue Jackets bench boss, Scott Arniel. Joining Arniel on the bench is last season’s captain and former Canucks blueliner Nolan Baumgartner, as well as former NHL player Mike Foligno, who joins the team after serving as an assistant coach with the Anaheim Ducks the previous two seasons. Archibald knows the new coaching staff gives him an opportunity to start over in Chicago. “I have heard great things about coach Arniel,” said Archibald. “I am excited to get going, I know I have improved from last year so hopefully I can get there and show the new coaches how I can play and hopefully they have enough faith in me to keep me up there all year. Some better luck finding the back of the net, combined with a more physical game, and we might be seeing a new and improved Darren Archibald with the Wolves this season.